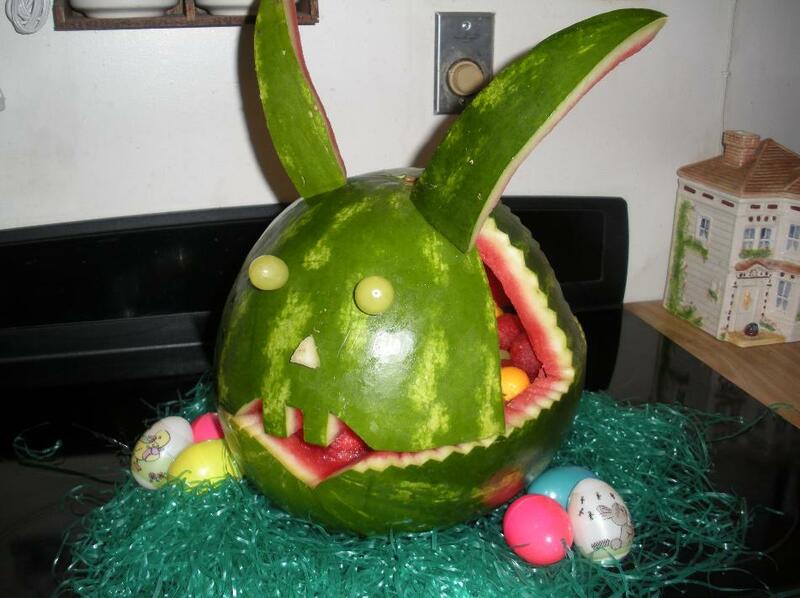 WATERMELON CARVING CONTEST FINALIST #1: THE RABBIT - What About Watermelon? Our first annual National Watermelon Carving Contest is in the books and I have to admit that it wasn’t easy narrowing the field down to just four finalists. There were so many great entries to choose from and after much deliberation (and a few arguments over which carving should get the last finalist spot), I was able to come up with the four carvings you’ll see here on What About Watermelon this week. On Friday, I’ll open the polls for everyone to vote for their favorite. Our first finalist in the National Watermelon Carving Contest is Ronna F. of Rockville, MD. Ronna’s Easter Bunny makes great use of the rind to create bunny ears. How she got the ears to stay on there is a mystery, but I’m guessing she used either toothpicks or magic (but probably toothpicks).